We know, from railway staff records recently made available on-line by ancestry.co.uk, that Joseph Casson was appointed as stationmaster at Davenport as from 1 May 1863, which may have been the date of re-opening of the station. Joseph Casson, born in Rochdale in 1807, had since 1856 been the stationmaster at the small station of Churwell, near Leeds (which closed in 1940), for which he received a salary of £60 per annum. In his new post at Davenport, the salary was just £46 6s., although in 1865 he was awarded an increase to £52. A tiny income by our standards: even when corrected for inflation it works out at less that £3,000 per year. Mr Casson and his wife Mary lived, probably rent-free, on what the 1871 census called 'Railway Lodge', a cottage adjacent to the level crossing where Garners Lane at that time crossed the line, as shown in red at the top left on the 1870s map extract opposite. Their responsibilities would have included operating the level crossing gates. Mr Casson died in service on 27 November 1871. 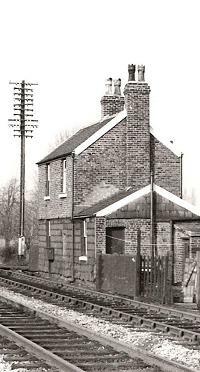 What the 'railway lodge' on Garner's Lane looked like we don't know for sure, but perhaps resembled the cottage which once stood at Woodsmoor level crossing. This lasted until modern times, although it showed signs of having been altered at some time: the picture above was taken by Trevor Moseley in 1965. Mr Casson's replacement, Thomas Ball, born around 1834 in Bowdon, Cheshire, had previously held a weekly-paid post as ticket collector. He took over on 12 January 1872, and was paid £54 per year, plus a rent allowance of £6 10s. He moved into the 'railway lodge' with his wife and two young daughters. 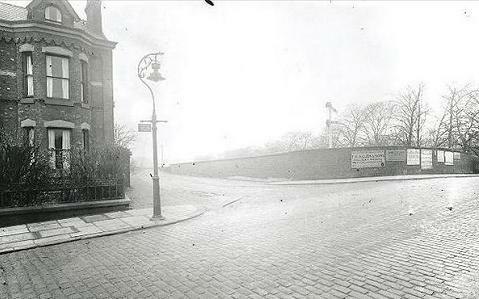 As some time in the 1880s, when Garners Lane was diverted to join Bramhall Lane south of the railway bridge, the level crossing was abolished. To do this, the railway company needed part of the garden of the house opposite the station, 124 Bramhall Lane (shown in red on the map opposite), so it bought the house, and moved Mr Ball and his family into it. The site of the house became the access to the siding used by local coal merchants. In the 1891 census the Balls also record a lodger: Fred Parsons, a railway porter, was perhaps his subordinate at Davenport station. Mr Ball had a long career at Davenport, latterly also overseeing the coal siding which was laid in in the 1880s alongside Garners Lane, and the move to the new booking office which dates from the same period. He retired on 31 August 1895, by which time his annual salary was £70. Frederick William Brereton, also formerly a weekly-paid railwayman, took up the post of Davenport Station Master on 1 December 1895. He was (it appears) born in July 1867 in Tabley, Cheshire, son of Thomas Brereton, a Police Sergeant. Mr Brereton had an illustrious career on the Railway. Having started work in 1882 as a Junior Porter at Handforth, he had also been a signalman at various places before becoming station master at Davenport. He left in 1901 for higher things, first in Manchester, where he married Emily Taylor in 1907. In 1911 he took up the post of Station Master, in charge of many staff, at the large and busy station in Huddersfield, a position he held until retirement in 1931, by which time his annual salary was £500. He retired with his wife to St Bees in Cumberland, where he died in 1933. Thanks to Ken Millward for inspiring this feature by finding the very old picture, in the Library of the Manchester Locomotive Society. It came from the collection of the late Wallace Sutherland of Davenport, whose records of our local rail history are a major source. Many of his pictures and notes appear in the two-volume pictorial history The Buxton Line by the late, and much-missed, Gregory K. Fox, published by his company Foxline in 2007 and essential reading for anyone interested in the line. The battered and faded print reproduced above is the oldest picture we have yet found of Davenport station. It shows the station as it was in approximately 1870: vegetation has had time to spread. Note the absence of the elevated booking office and footbridge. Passengers entered the station by a gateway close to where a way has been opened up again in recent times, and perhaps were allowed to cross the track by what looks like a boarded crossing. 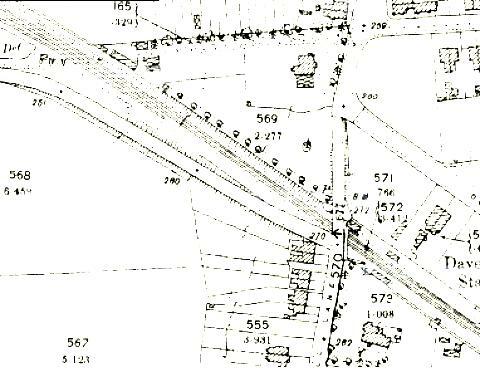 The map extract on the left dates from the same period; the 'signal post' and the small building which possibly sheltered a signalman can just be made out in the picture, as can some of the houses which had been built soon after the opening of the station. The station building seems to have something of the architecture of the houses behind - the same local builder, perhaps. When was the station opened? The Stockport, Disley and Whaley Bridge line opened in June 1857, but at the opening there was no mention of a station here. Stockport librarian William Skillern and local rail enthusiast Wallace Sutherland, researching the history of the line in the 1960s, gained access to the minute books of the company. From these they gathered that soon after the opening the company received a complaint from Colonel William Davenport Davenport [sic] of Bramhall Hall, who had allowed the line to cross a his land, that they had promised him that there would be a station. 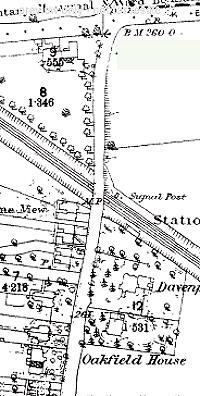 So a 'small station' was built, and named 'Davenport' - a name which attached itself to the settlement which grew around the station. The oldest reference to the station we have found in the Manchester Guardian newspaper was the above classified advertisment (on the front page as things were done in those days) of 14 April 1858, ofering 'eligible villa and housing land' for sale 'near the Davenport station' on begalf of Colonel Davenport. However, there appears to have been no rush to build houses, and Skillern and Sutherland suggest that the station may have closed again soon afterwards, but was open again by 1863. 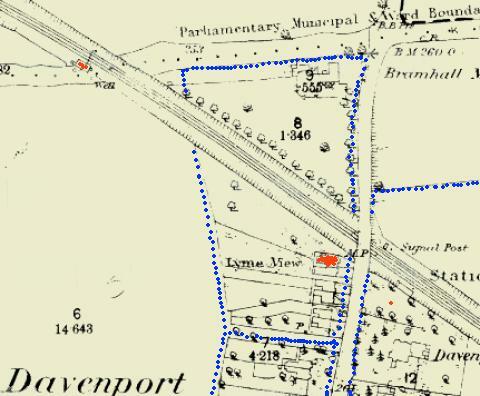 The blue dotted lines on the map show some field boundaries of Isaac Cheetham's farm; note how they coincide with plots of the early houses and with the short cart-track which later became Oakfield Road. The pair of large semi-detached houses on the other side of Bramhall Lane, known as 'Lyme View' as the hills of Lyme Park sould be seen on the skyline, and later numbered 124 and 126 Bramhall Lane, were built on a plot sold by Colonel Davenport to a John Vaughan in May 1863. 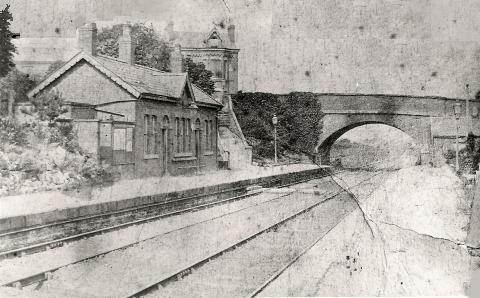 This photograph shows the station some time around 1900. Why the space between the rails on the right has been filled in, we have no idea. The station building, now serving as general and ladies' waiting rooms, is little changed apart from assorted notices and advertising posters, but the footbridge, in the lattice-girder form favoured by the London and North Western Railway (LNWR), as has the booking office which is obscured in this view by the tree, and a brick-built waiting room in standard LNWR style. 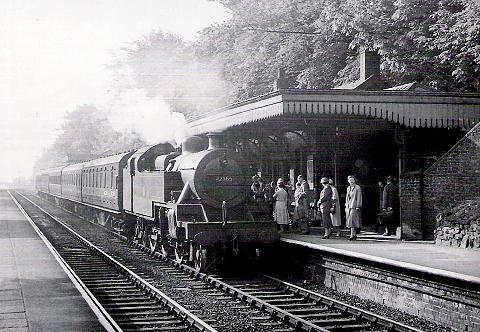 At a later date, the old station building was apparently rebuilt with a different roof, and equipped with canopies over the platform, as seen in the 1950s view above with a typical train of the period, hauled by a 2-6-4 tank engine. 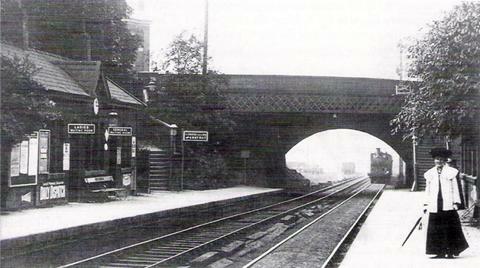 An additional waiting shelter, believed to date from the 1920s, can be glimpsed behind the train. Picture by Wallace Sutherland, courtesy of Foxline. All buildings on the Manchester-bound platform were replaced in the 1970s by the present structure, and the building on the other side was also demolished and replaced by the simple shelter now on offer. The lattice-girder bridge was replaced, by the plate-girder one still in use today, in 1945. 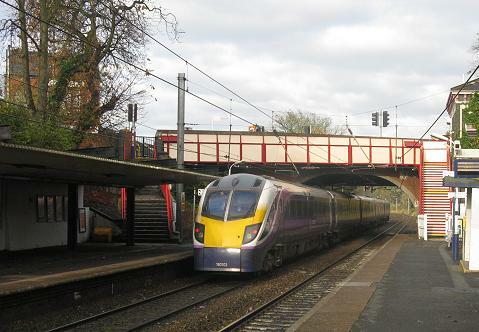 The view above is from October 2011, with Northern Rail train 180 103. 126 Bramhall Lane stands behind. 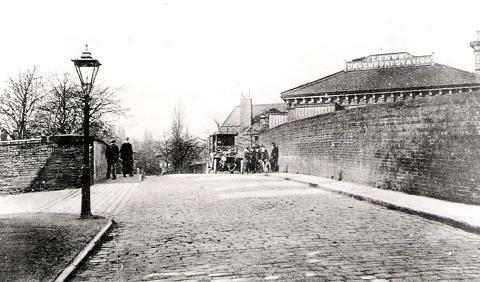 An Edwardian view of the station from the street, with a taxi (?) waiting for customers.The new booking office can be seen, and Garners Lane, which now been diverted to allow the abolition of the level crossing, is on the left. This map from the 1898 Ordnance Survey edition shows the changes, including the diverted Garner's Lane, the booking office and footbridge. Most of Mile End Farm had by this time been sold for housing: the entrance to the Davenport Park estate (established in 1877) can be seen, running parallel to the line. The old route of the lane was absorbed into grounds of the large house, Bramall Mount, and used for access to a stable block which still exists as staff premises within Cale Green Park, although the old route of the lane itself has been obliterated. Bramall Mount is one of the oldest houses in Davenport: it was built before the railway (see our feature A Postcard from Davenport, No.2). Oakfield Road was yet to be created. This picture from the 1920s shows little change from 1900. 124 Bramhall Lane is still a house; not long after this, in a further widening of Garner's Lane, the house was demolished, leaving its partner no. 126 standing alone, later to have its front window bays removed and become the 'convenience store' we see today. The LNWR lower-quadrant signal visible in the picture has two arms, the 'starter' for Davenport Junction signalbox and below it the 'distant' for Woodsmoor Crossing. Written by Charlie Hulme, November 2011.